Let’s Support Fely in the Hi-5 Surprise Concert in Manila! Let’s support fellow Filipina, Fely Irvine, in their first-ever Hi-5 Concert in Manila entitled, Hi-5 Surprise on November 25-30, 2009 at the Megatent, Meralco Avenue. Buy your tickets from Our Awesome Planet! Here is a sample Monster Song in A cappella by Hi-5 (New Cast Members) during their press tour in Manila. Update: Nov 15 crocs redemption at 4/F Podium, Pasig. Just present your Hi-5 tickets! fun-filled surprise with heaps of singing, dancing, and party games. hit the stage…but remember don’t tell Chat! 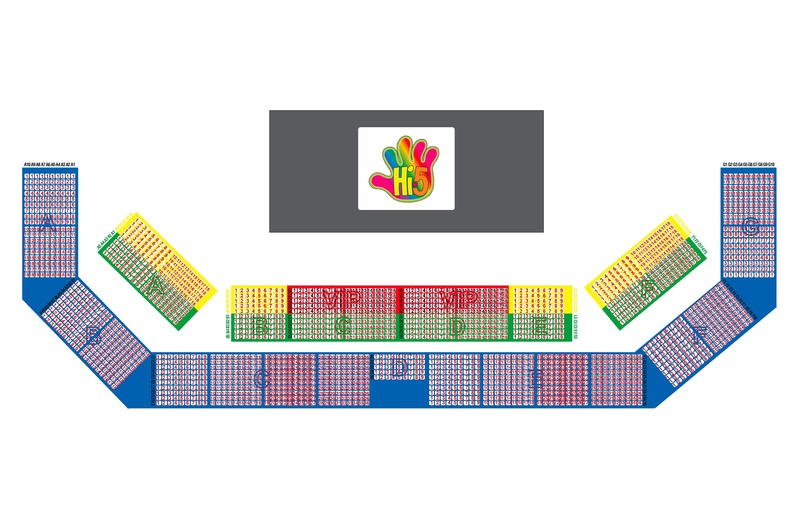 P2,400 for the VIP tickets where your kids can dance with the HI-5 ! Oh my! Anton, I have to say that the tickets are expensive but my daughter really loves Hi-5 and we missed their mall tour early this month so I think I owe her one. Parang with the small price difference of the yellow/green section, one would better add a little to get to the VIP section na lang. Blue is out especially if you’re bringing a toddler. but you get free crocs if you purchase the tickets right? yes you get free crocs limited styles, and size though..
hi, would there be any other way to get the free crocs aside in getting it in Podium on Nov15? any other schedules at least? thanks! yes any ticket I believe. hi anton! thanks for the heads up. btw, has anybody been able to redeem a Crocs pair yesterday at the Podium? Crocs PH said redemption starts pa lang on the 25th? Hi! Do you have an update on when the concert is gonna push-thru? I never heard anything after it was postponed. Thanks! It is pushing through in September. There will be an announcement soon. Thank you for signing up to become a PRIORITY CUSTOMER for Hi-5 House Hits! “Hi-5 House Hits” will be the biggest Hi-5 concert ever. And not only that, it will feature all of Hi-5’s most favourite, best loved songs for you to sing and dance to. For more information about the show including schedule, ticket prices and special offers, please see attached file. Once we received your email, we will contact you to process your ticket order. Thank you and see you at “Hi-5 House Hits”- a show where YOU become the star! Unit 402 4/F A.B. Sandoval Bldg.